Ireland and stories go hand in hand, the shame being that most of them end up being told in pubs instead of on paper; so it is very pleasing indeed to see a new set, especially as the author has told them in a wide variety of styles and paces. Ever wondered how Damon Runyon would write a tall Irish fishing tale? Well, here’s your chance to find out. 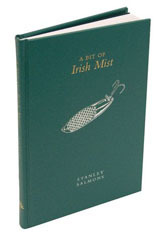 If you are a fan of short stories about fishing there is something here to suit everyone and I can see Irish Mist becoming a great favourite. As usual where Medlar Press editions are concerned, the production is a cut above the average – half the joy of a good book is the heft of it in your hand and this one doesn’t disappoint.